Scirpus interstinctus Vahl, Enum. 2: 251. 1806. 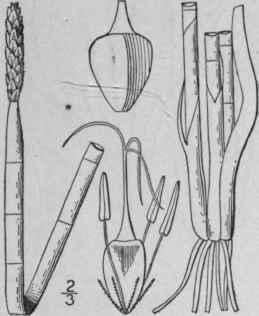 Scirpus cquisetoides Ell. Bot. S. C. & Ga. 1: 79. 1816. 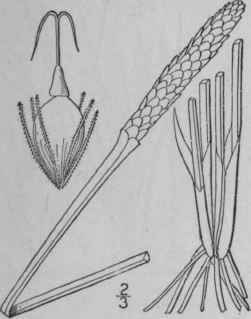 Eleocharis interstincta R. & S. Syst. 2: 148. 1817. Eleocharis equisetoides Torr. Am. 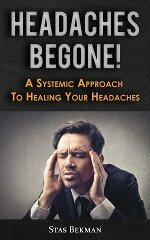 Lye. 3: 296. 1836. Perennial by stout rootstocks, sometimes tuber-ifcrotis; culms terete, hollow, nodose, papillose, 1 1/2°-3° tall, the sterile ones sharp-pointed. Sheaths oblique, membranous, brown or green, the lower sometimes bearing short blades; spikelet terete, cylindric, many-flowered, subacute, i'-i 1/2" long, 2" in diameter, not thicker than the culm; scales ovate, orbicular or obo-vate, obtuse or the upper acute, narrowly scarious-margined, faintly many-nerved, persistent; bristles about 6, rigid, retrorsely barbed, as long as the body of the achene or shorter; stamens 3; style 3-cleft, exserted; achene obovoid, brown, shining, with minute transverse ridges, obtusely trigonous, 2 or 3 times as long as the conic acute black tubercle. In water, Massachusetts to Wisconsin, Florida, the West Indies and Mexico. July-Sept.
Scirpus mutatus L. Am. Acad. 5: 391. 1760. Scirpus quadrangulatus Michx. Fl. Bor. Am. 1: 30. 1803. 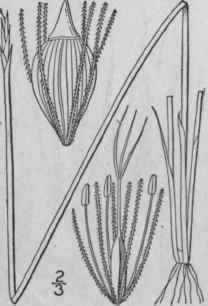 Eleocharis quadrangulata R. & S. Syst. 2: 155. 1817. Eleocharis mutata R. & S. Syst. 2: 155. 1817. Perennial by stout rootstocks, sometimes tuberif-erous; culms sharply 3-4-angled, stout, not nodose, papillose, 2°-4° tall. Sheaths purplish-brown or green, membranous, sometimes bearing short blade::; cpikelet terete, acute, cylindric, l'-2' long, 2" in diameter, many-flowered, about as thick as the culm; scales coriaceous, broadly ovate or obovate, obtuse or the upper subacute, scarious-margined and sometimes with a narrow brown band within the margins, faintly many-nerved, persistent; bristles about 6, rigid, retrorsely barbed, about as long as the achene; stamens 3; style 3-cleft; achene obovoid, biconvex or slightly angled on the back, minutely cancellate, about twice as long as the conic acute tubercle. In ponds, streams and swamps, Massachusetts to New Jersey, Ontario, Michigan, Alabama, Missouri, Texas and Guatemala. West Indies and South America. July-Sept.
Eleocharis Robbinsii Oakes, Hovey's Mag. 7: 178. 1841. Perennial by slender rootstocks, culms slender, 3-angled, continuous, 6'-2° long, sometimes producing numerous filiform flaccid sterile branches from the base. Sheaths ap-pressed, obliquely truncate; spikelet subulate, few-flowered, not thicker than the culm, 6"-10" long, 1" in diameter; scales lanceolate or oblong-lanceolate, obtuse or subacute, strongly concave, faintly several-nerved, persistently clasping the rachis, narrowly scarious-margined; style 3-cleft; bristles 6, equalling the achene and tubercle, retrorsely barbed; achene obovoid, light brown, biconvex or very obtusely angled on the back, somewhat longer than the conic-subulate flattened tubercle, which has a raised ring around its base. In shallow water, Nova Scotia to Michigan, south to Florida. Aug.-Sept.